Best Outdoor Toys for 1 Year Old Reviews: Top-5 in April 2019! Outdoor toys come to a large variety of shapes, sizes, and configurations and deliver virtually infinite types of fun. In this article, I present you with five amazing outdoor toys that are all tested and proven for both security, safety, clean materials and designed to deliver hours of fun. Before you go out and buy a cheap toy, one that costs a fifth of a standard toy such as a Little Tykes model, which is designed to provide beyond regulatory conformance, take a look at your environment and your children and remember, children are little danger spots seeking challenges that are not always in relation to their safety and security. As an adult, it is your responsibility to assure that their play environment is beyond safe, but within the bounds of reason, and even mischievous entertainment. The U.S. Consumer Product Safety Commission (CPSC) has set up regulations, and closely monitors and regulates toys. All toys made in the USA or imported into the United States after 1995 must meet CPSC standards. Stuffed toys must be washable. Painted toys have to be coated with lead-free paint. Art materials should state in clear, bold characters that they are nontoxic. Crayons and paints must be ASTM D-4236 compliant, and this must be labeled on the packaging. Moving parts must be free of hazardous material finishes, such as sharp edges. I know we all loved the hand me downs and were happy to play with grandpa’s tin soldiers, but hand me downs can be dangerous. Consider the hand me down before you pass it on to your child, or give it to a grandchild. Do not buy deafening sound toys, those pesky cheap electronic devices that have fog horns for speakers will both damage the child’s ears as well as prove to be extreme nuisances around the house or the yard. When you buy a toy, consider your child’s age and the complexity of the toy, remember that small toddlers put everything in their mouth. Take under consideration your child’s temperament, what is he/she like? Some children are quick to anger when they get frustrated; others are more complacent, match the reaction you expect to the toy. You don’t want the toy to be destroyed in the first few seconds of play, and you don’t want to give a toy to a child only to make that child get frustrated due to the incompatibility. Now let’s take a look at five classic games that always work out and always win in the fun and happiness rating. This is the Little Tikes Princess Cozy Coupe® 30th Anniversary Edition, which is a classic girl ride due to its colors, but honestly, I don’t think any 1 year old will be bothered by the pink color, so lets put this color issue aside for now and concentrate on this amazing toy. Little Tykes produces quality products, and this is one of their leading outdoor plastic cars. Its toddler size, 29.50”L x 16.50”W x 33.50”H and weighs only 17.25lbs. This model comes with a removable floor board, and consider that not all the floorboards are the same color. The floorboard is an important safety feature and should be used when you want to push the toy. If your child wants to self-propel with their little feet, then remove the floorboard. There is a convenient adult handle on the back for parent-controlled push rides, and the high seat back and cup holders in the rear are designed for maximum child support. The ignition switch makes a clicking sound, and the horn honks. The gas tank cover opens too, and the wheels rotate smoothly, as well as spin 360o around. You do need to assemble this model when it arrives, and the maximum load bearing is 50 lbs. This is a classic, you see them everywhere, and they are always durable. This is a great outdoor toy, and some even use it indoors too. 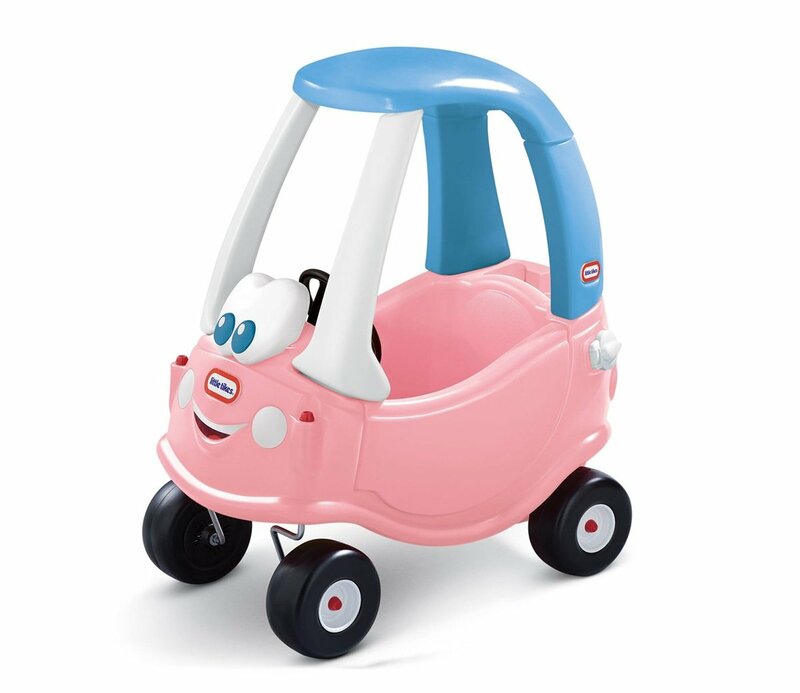 This is the Little Tikes Princess Cozy Coupe Trailer for the Little Tikes Princess Cozy Coupe®. It attaches easily and lets your child pull along an assortment of toys, and in some cases other children too. 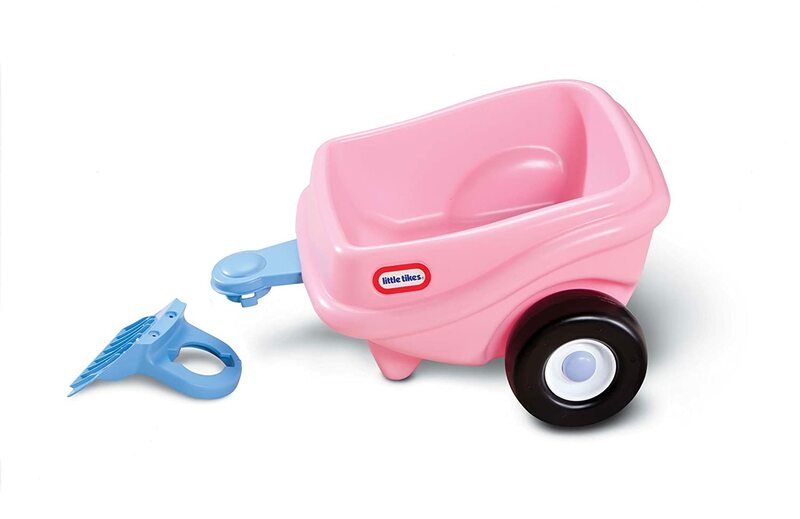 The Little Tikes Princess Cozy Coupe Trailer is 19.50″L x 15.00″W x 9.50″H and weighs 4.75lbs. This is designed for use as a stand-alone or when using the included hitch, connects the toy to the Little Tikes Princess Cozy Coupe. It works outdoors and indoors and allows your child to get the hang of loading and unloading a trailer. The material is classic Little Tykes plastic, and the wheels smoothly rotate for an effortless play experience. This model does require some assembly before first-time use. Why just buy a coupe when you can buy a trailer too and let your child spend hours and hours transporting goods all over their imaginary world. The Step2 Kids Swing is a classic plastic swing designed for utmost safety, as well as adaptable use for versatile attachment to any outdoor construct or indoor frame. The Step2Kids is made of a very resilient and durable plastic designed to hold 50lbs of weight while swinging. 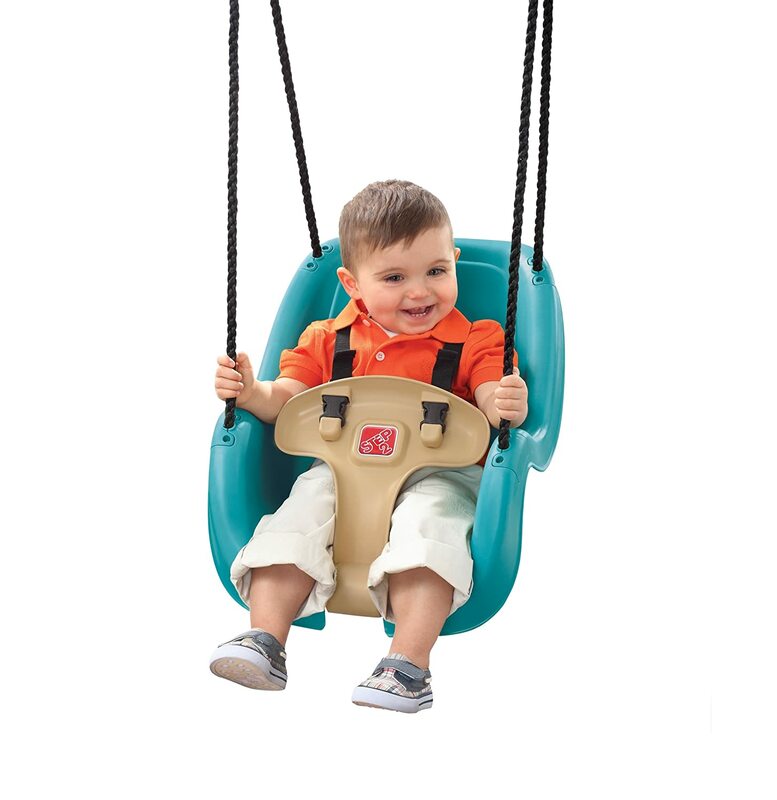 This model comes with a security restraint system that assures your toddler cannot fall out when swinging, and the seat is designed for a snug and comfortable fit. This is an all-weather proof model, and that includes the nylon braided rope. The seat is easy to clean with a simple wash and wipe. This model can fit most swing sets, can attach to a solid tree and can be attached to the Step2 Playhouse Climber & Swing Extension, as well as connecting to the Step2 Adventure Lodge Play Center. This product is 23.00” H x 11.00” W x 16.10” D and weighs 6 Lbs and is very easy to assemble. Nothing beats a good swing, and all the big world wars started over who gets to swing first. This is another Little Tykes winner, Spiralin’ Seas Waterpark which is an amazing dynamic water table that delivers hours of water drenching fun. This is one toy that should never be allowed indoors. Otherwise, you will definitively end up with drenched furniture. 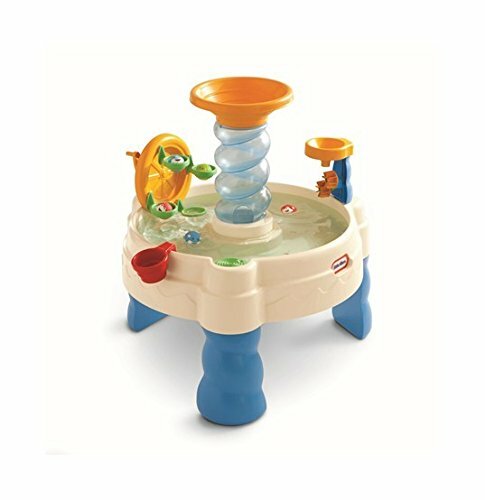 The Little Tikes Spiralin’ Seas Waterpark Play Table is 29.00”L x 29.00”W x 31.50”H and weighs 10.00lbs; this is a rugged and sturdy little table that holds up to 7gallons of water. Once filled your children can start to enjoy an amazing set of experiences with the many interfaces. Your child gets to play with the ball spiral that fascinates them to watch how the balls roll around and around until they hit the water. There is a cute Ferris wheel that scoops up the balls as well as drops them off, and these softballs fill up with water and can be squeezed like little water pistols. You get a child-sized cup, just big enough to be effective and they use this to power water into a funnel that turns small water wheels. The water ball spinner is also what powers the flow of the lazy river. Nothing beats a sunny, wet day, and what better way to keep the small ‘uns occupied than with the Little Tikes Spiralin’ Seas Waterpark Play Table, what a classic! On those hot sizzling summer days, one of the best memories is from sprinkler systems wetting you as you skip over them. 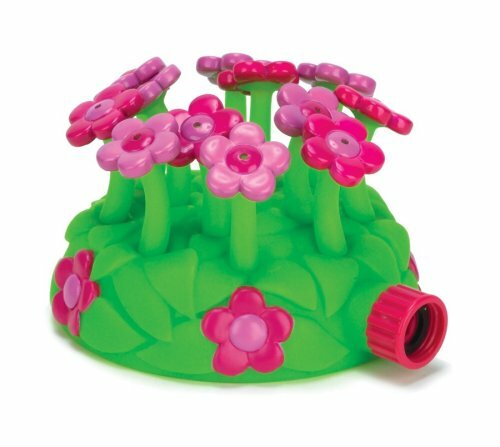 Well, now there is the Melissa & Doug Sunny Patch Blossom Bright Sprinkler, which is a child dedicated toy that provides them with hours of perfect water sprinkling fun. The Melissa & Doug Sunny Patch Blossom Bright Sprinkler is 7″ x 6″ x 8″ and weighs around 1 pound. You connect it to a standard garden hose and turn on the water. Sit back and relax, your children will be too busy enjoying this beautifully crafted plastic sprinkler system. This is a very basic but exceptional toy, its crafted to attract attention and to perform perfectly. Nothing simpler than a sprinkler system.